What is a "Search Problem"? 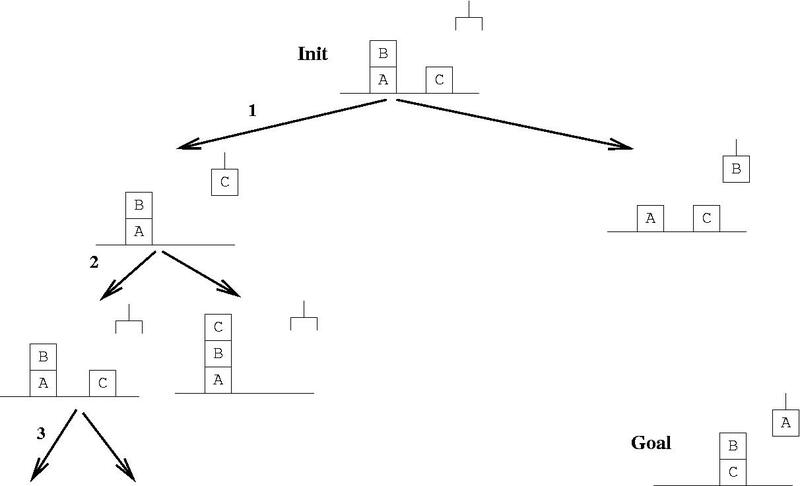 As depth first, but do not generate nodes deeper in the tree than an a priori fixed limit. If there is no solution within limit l, then no solution will be found. Depth-Limited Search has the main advantage that the search process can't descend forever (in a branch without solution). However, it will not find a solution if all solutions require a depth greater than the limit. To overcome this problem (and to maintain the advantages of depth limited depth first search), one has introduced a form in which the limit is increased if there is no solution of a limit l. That is, choose initially l=1, iteratively increase l by 1, and perform on each level Depth Limited Depth First search until a solution is found. The safest way to avoid any repeated states is to store all states visited and compare each node whether it has been visited before. If yes, don't add it. The problem with this strategy is that firstly you have to store all states visited (space) and make many comparisons (time). Do not return to the state you came from. That is, do not generate a node that is equal to your parent. Do not create cycles. That is, do not generate a node that is equal to any of your ancestors. Assume a heuristic function h such that h(n) is the estimated cost of the cheapest path from the state at node n to a goal state. 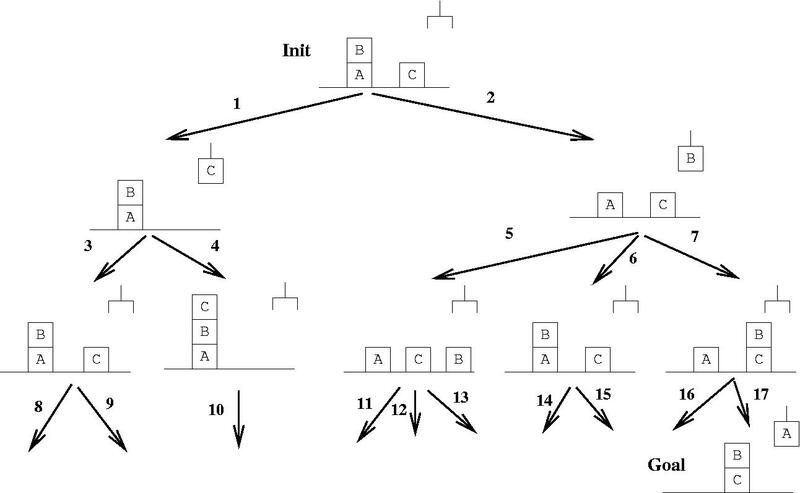 In best-first-search the insertion function orders the nodes with respect to some measure. according to f=g+h with g actual cost to that node, h estimated cost to the goal. In the A* algorithm the heuristic function h must be optimistic in order to find the best solution. Possibilities from Arad: Go to Zerind, Timisoara, or Sibiu? Closest air distance Sibiu, hence go to Sibiu. 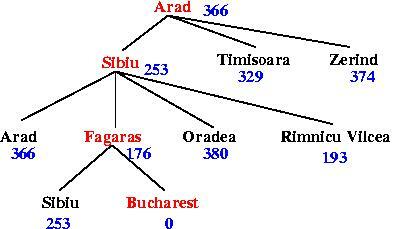 Possibilities from Sibiu: Arad, Fagaras, Oradea, or Rimnicu Vilcea? 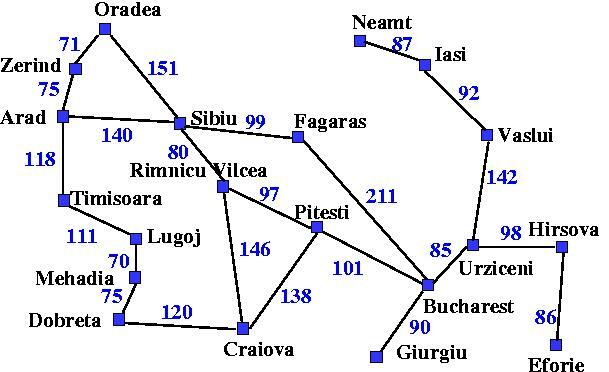 Closest air distance Fagaras, hence go to Fagaras. Possibilities from Fagaras: Go to Sibiu or Bucharest? Sibiu (253) or Bucharest (0)? Closest air distance Bucharest, hence go to Bucharest. That is 140km +99km +211km = 450km . Most promising Sibiu, hence explore going to Sibiu. 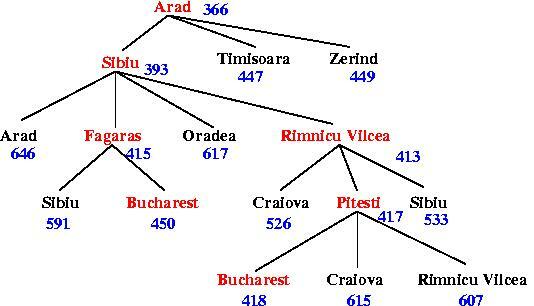 Possibilities from Rimnicu Vilcea: Sibiu, Pitesti, or Craiova? Possibilities from Fagaras: Sibiu, or Bucharest? Possibilities from Pitesti: Rimnicu Vilcea, Craiova, or Bucharest? Overall most promising go to Bucharest from Pitesti. Since there is no way to get on a shorter route to Bucharest the last one is taken. Restriction on h: the heuristic function h may never overestimate the cost to reach the goal (such a heuristic is called admissible. Example: h as air distance is an optimistic estimate for a travel distance. If h is admissible, then f=g+h is as well. Hill climbing is a search method, in which the next node to expand, is the node with the highest value of the nodes generated from the expansion of the current node. Simulated annealing: Allow for bad moves as well (that is, moves that lead down-hill), where the probability of such a move decreases exponentially with its badness. With decreasing temperature T, bad moves become less and less likely. In the extreme case, the heuristic function exactly knows what to do. Then there is no search, but we have an algorithmic procedure. S. Russell, P. Norvig. Artificial Intelligence - A Modern Approach. 2nd Edition, Pearson Education, 2003. Chapters 3 & 4. Judea Pearl: Heuristics - Intelligent Search Strategies for Computer Problem Solving, Addison-Wesley, 1984. Reading, Massachusetts. The URL of this page is http://www.cs.bham.ac.uk/~mmk/Teaching/AI/Teaching/AI/l8.html.